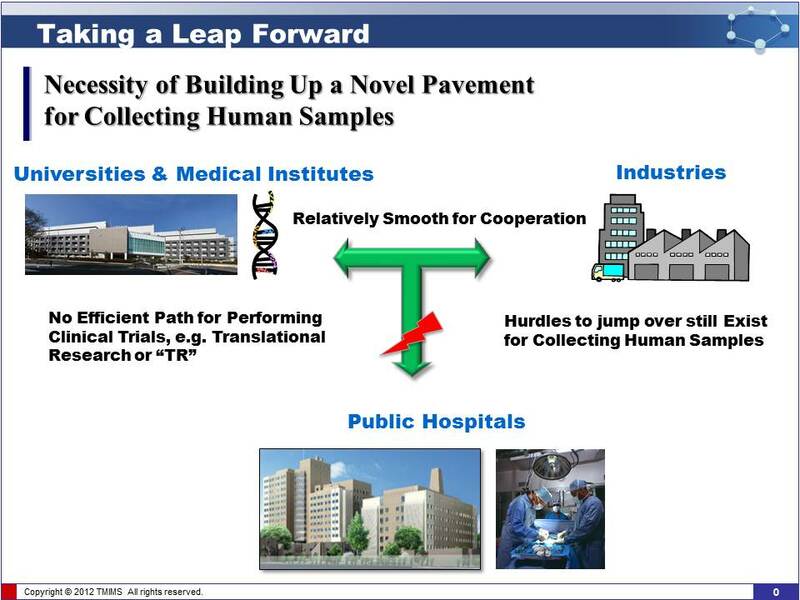 Tokyo Biomarker Innovation Research Association or “TOBIRA” (meaning “doors” in Japanese) was established in 2011, under an official of approval of the Ministry of Economy, Trade and Industry of Japan (METI), as a bland new medical consortium in Tokyo Metropolitan City. 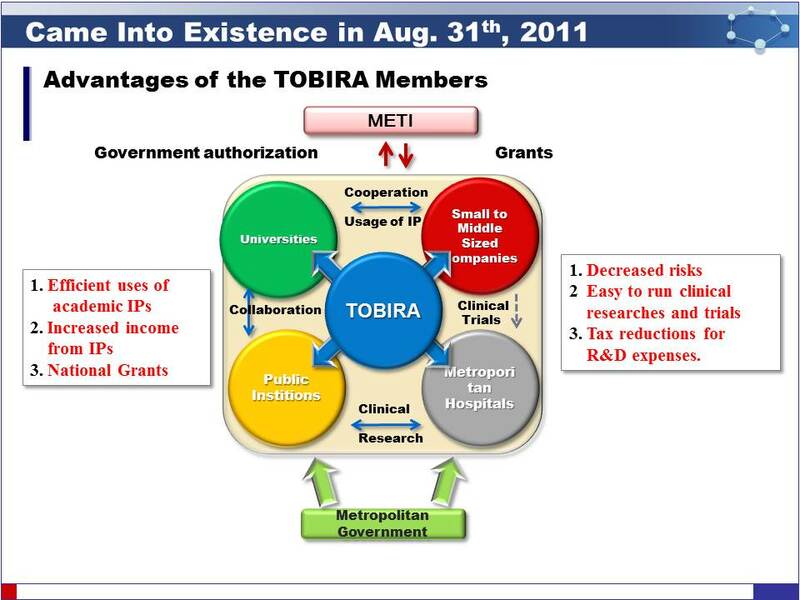 Under the umbrella of “TOBIRA”, members from industries (more than ten), scientific academia (three universities) , medical institutions (two), and Tokyo Metropolitan Hospitals (around ten,7,800 beds in total) are being involved, and are efficiently collaborating with each other in order to invent new biomarkers, diagnostic products/machines, and furthermore to pave a new avenue for novel medical treatments for cancer, infection, ischemic diseases, and lifestyle-related diseases such as hypertension, hyper-cholesterol and diabetes, respectively. 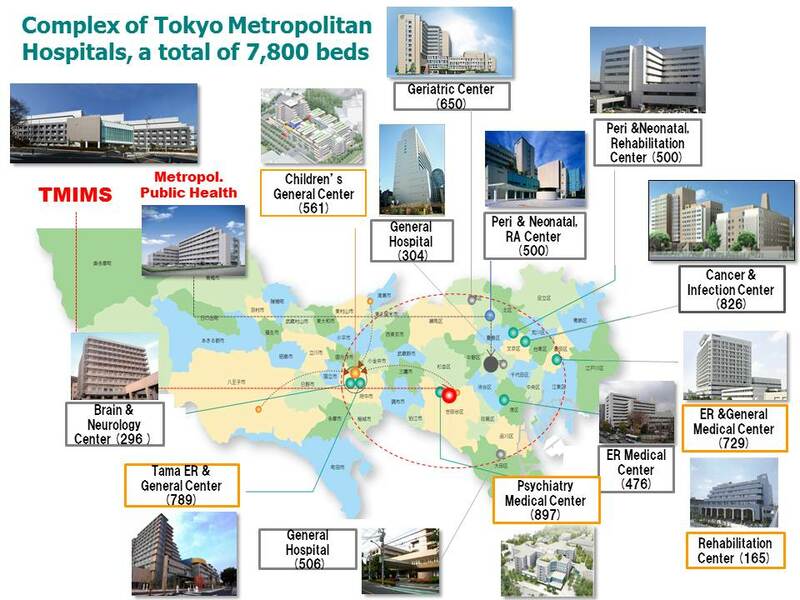 The final goal of “TOBIRA” is thus to achieve highly advanced medical treatments in Tokyo Metropolitan City by the year of 2020, when “2020 Tokyo Olympic Games” is to be opened. In 2013, moreover, “TOBIRA” set up “TOBIRA BioTechnology Partners” for the purpose of acceleration of more effective introductions of diagnostic products and/or medicines being invented at “TOBIRA” than before. “TOBIRA” so far has successfully marketed “MUSTagTM” for the simultaneous detection of cytokines, “High Speed/Resolution Visional Analysis Camera” for the experimental animal- and human-use, and “1st Generation Highly-sensitive Fluorescence Immunochromatography Measurement Device” for the detection of Flu. viruses. “TOBIRA” is now being involved in “2nd Generation Highly-sensitive Fluorescence Immunochromatography Measurement Device” to diagnose Flu. ,Fabry disease, cervical, bladder & liver cancers, and sarcopenia, respectively. “TOBIRA” is also involved in the inventions of “Super-Speed RT-PCR” as well as “Highly Sensitive Immunochromatography” for the detection of influenza types and infections. Regarding therapeutic medicines, furthermore, “TOBIRA” is collaborating with a couple hospitals for ophthalmological, dermatological, and skeletal muscle diseases, as well. “TOBIRA” holds a “Scientific Forum” once a year by its own expense, where distinguished researchers from all over the world are invited and frankly to exchange their own opinions among all the audiences there. Finally, “TOBIRA” is proud of informing that “TOBIRA” has determined to invite young and/or female researchers, in particular, to deliver their lectures at the “Forum”, and some amounts of the research founding will always be awarded to one or two researchers thus participated in the “Forum”. Copyright© TOBIRA All Rights Reserved.